Amanda Bynes has come back with another bizarre tweet revealing she feels “pudgy”. Amanda Bynes, 26, has once again taken to Twitter to discuss her feelings. While last week it was a graphic description about what she wanted her crush rapper Drake to do to her, this week it is what Amanda Bynes has dubbed “girl problems”. The actress posted the comment along with a self snapped picture of herself. 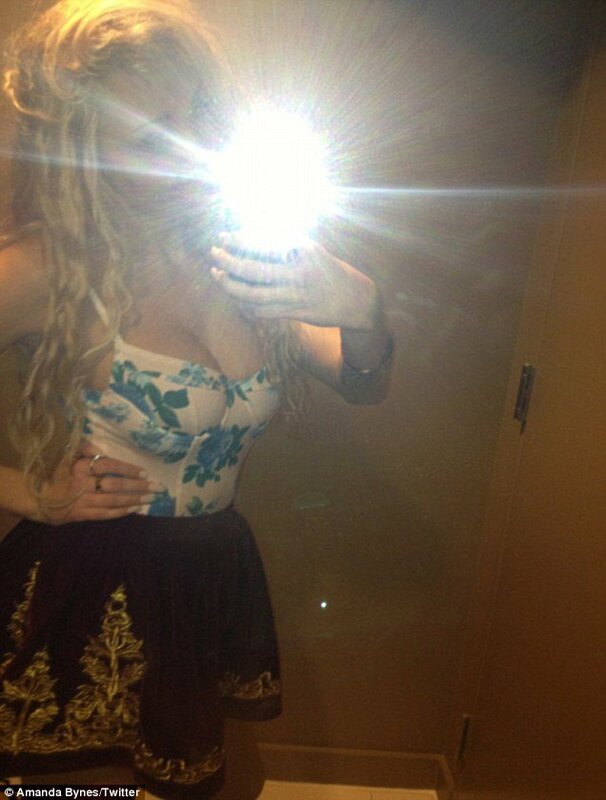 Posing in front of the mirror with one of her less than perfect blonde curly wigs on, amanda Bynes struggles to keep her cleavage inside a floral bodysuit with a built in bra that is far too small for. She donned the too tight bodysuit with a short black skirt with gold embroidery dress. Just a few hours later Amanda Bynes had a change of heart, posting a picture of the same outfit with a blue short sleeved shirt over it. Despite feeling “pudgy” Amanda Bynes has recently lost weight and revealed to Us Magazine she plans to lose more.